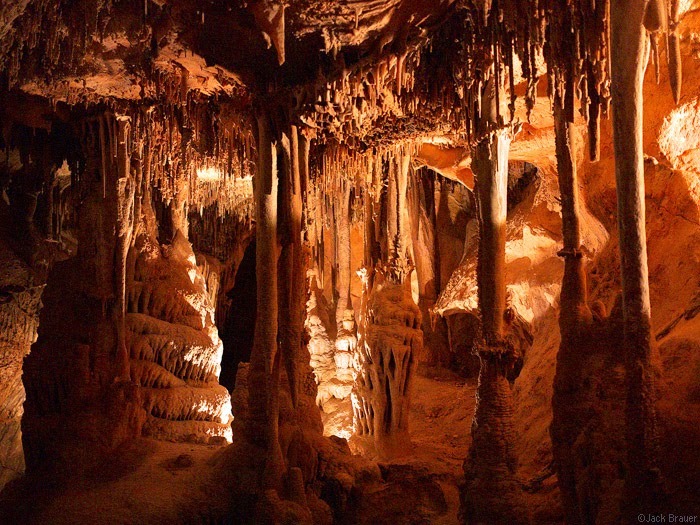 A photograph from Lehman Caves in Great Basin National Park, eastern Nevada. And so Carmel saves he world, by going off to find a hole to hide in — Lehman Cave. In this universe, it's actually more than one cave, Lehman Caves, and it's part of a national park. "That about summed it up: the laws were not necessarily fascist Gestapo racist pigs (words largely unknown in Texas), but they were people who would find it a relief if bothersome and rebellious individualist disappeared, however bloody the disappearance might be," page 420. By coincidence, Arthur Hlavaty has just done a blog post on the divide between police critics from the left who want to talk about racism, and police critics from libertarianism who want to focus on individual rights; apparently only weirdoes think that both groups have a point. "no governing body can ever obtain an accurate account of reality from those over whom in holds power," pages 423-424, and sentences immediately following; a restatement of the SNAFU principle and how it affects government. "Democracy, in short, must cease until the emergency is ended," page 425. Of course, the current emergency is "terrorism." because of the number of crisscrossing stories being told by Dr. Naismith, the mgt., Bonnie Quint, etc., I find it helpful to create a detailed mental image of each of the characters. For example, I could not escape seeing Bruce Willis in Breakfast of Champions (http://4.bp.blogspot.com/-9S62JWezHmM/T2YYHb8nzII/AAAAAAAACQQ/X2uxEeYKh6M/s1600/bruce_willis_nick_nolte_breakfast_of_champions_001.jpg : my imagination added a mustache) as Tobias Knight. Had a harder time imagining what Roy Ubu & Peter Kurten looked like. I have a hard time keeping the characters and plotlines straight, too. It helps to have an electronic version of the book and search for a character's name. Pg. 426 mentions Candlemas, February 2, James Joyce's birthday. On July 23, 1985, I walked through an old cemetery in Ingolstadt, Bavaria. Many of the tombstones had rosy crosses. Mary Shelley had Dr. Frankenstein go to school in Ingolstadt because of her husband's affection for Adam Weishaupt. This fact delighted Bob Wilson. p. 416: "The only thing to do was find a whole and bury myself." p.423: the paragraph that starts: "Among all the men wandering around the Desert Door..." suggests the Abyss. Fred Filiarisus ( fill air is us, and also has the word "liar") seems like the Ace or Knight of Swords type, master of the element Air. Everything he does to track Carmel has that quality.